Baby chick season is here! I’m sharing my DIY chick brooder box ideas in this post. If you’re planning to purchase a few baby chicks this spring, then you’ll need a brooder box. Below includes my DIY chick brooder box ideas to get you started. This time last year, Ben and I were frantically preparing for baby chicks and baby goats. We had no idea what we were getting ourselves into, but we dove head first into our homesteading dream. In actuality, I didn’t really know what “modern homesteading” even meant at the time. 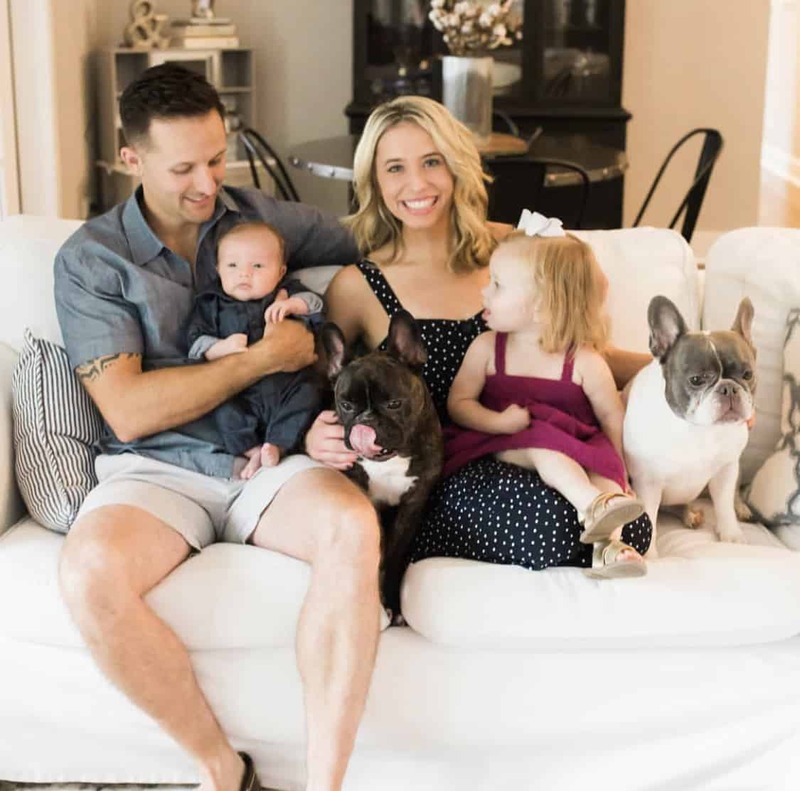 But we knew that we wanted to live a healthier and more sustainable lifestyle for ourselves and our family, so we decided to go for it. Little did we know that our little backyard farming adventures would turn into a full blown modern homestead. Crazy how life works out, isn’t it? Before your baby chicks arrive, you’ll need to have your brooder box set up and ready to go. Your DIY brooder box will function as a home for your baby chicks for the first 4-6 weeks. 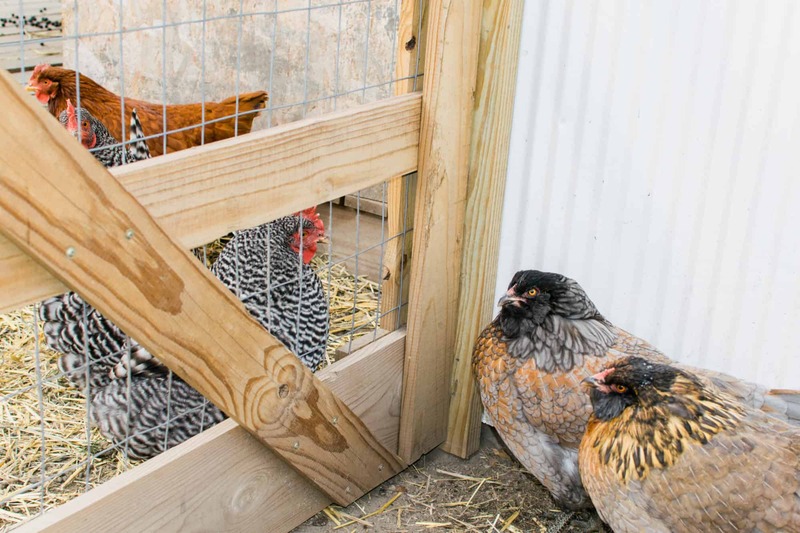 When considering brooder box options, there are tons of different ideas. The brooder box doesn’t need to be anything fancy, but it needs to function as a safe home for your baby chicks. Below includes some DIY chick brooder box ideas to start raising baby chicks. Plastic Storage Container: For the first few days, we keep our baby chicks in a large plastic storage container. Because you need to keep a close eye on the babies, we keep the storage container on the first floor of the house for at least 24 hours. We then transition our baby chicks to a larger DIY chick brooder box in the basement (while still checking on the chicks multiple times per day!) Plastic storage containers are a great (and cheap!) option, but your chicks will likely outgrow the tub quickly. Baby Pool: Many people choose to use a baby pool as a DIY chick brooder box. Although we have not tried this option, a baby pool is a cost efficient way to house your baby chicks. The major downside is that your baby chicks will likely outgrow a baby pool super quickly. If you purchase a baby pool with short sides, then your chicks will likely climb out. Galvanized Bucket: One of the major perks of using a solid surface material for a brooder box is the ease of clean up. Baby chicks poop a lot, so having a solid surface, like plastic or galvanized metal, makes it easy to disinfect and reuse the container as a brooder for future baby chicks. Again, one major downside is that your chicks will probably outgrow the galvanized bucket rather quickly. 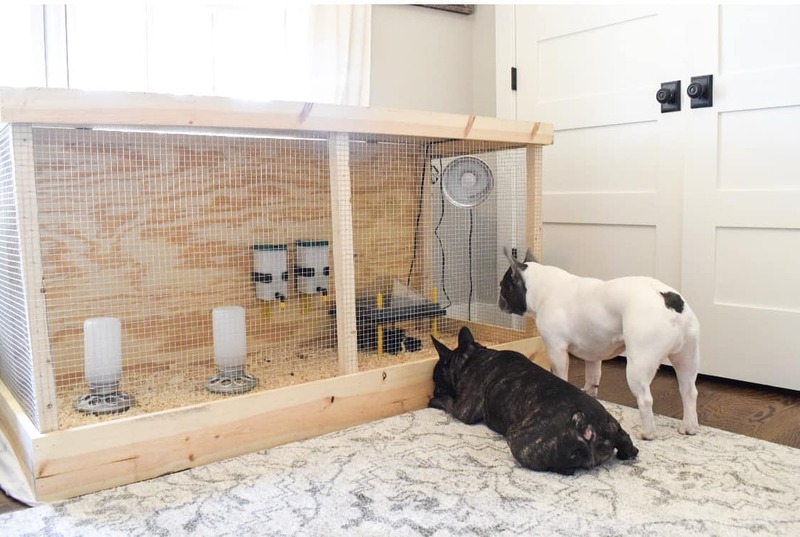 Wooden Crate: Depending on the size of your wooden crate and how many baby chicks you have, you might be able to get away with using a large wooden crate as your brooder box for the entire 4-6 weeks. Again, we haven’t tried this option, but our DIY chick brooder box below would be a (somewhat) similar option. Make Your Own: The above options are great temporary DIY chick brooder box ideas, but they aren’t a very functional long term housing plan. The solution? Make your own DIY chick brooder box. When we decided to place our first order for baby chicks, Ben immediately started brainstorming different ideas for making our own brooder box. We wanted a brooder box that would 1) fit 10 baby chicks; 2) would last; and 3) minimize dust and overall mess. Ben constructed our DIY chick brooder box out of plywood and hardware cloth fencing. The back of the brooder box is full plywood, while the 2 sides and the front is enclosed with the hardware cloth fencing. Ben surrounded the front and sides of the brooder box with a 1 foot tall plexiglass covering to minimize dust from the chickens scratching. This past year, we raised 3 rounds of baby chicks. Our DIY chick brooder box held up perfectly for all 20 of those chicks! Simply clean out the brooder each time and spread fresh pine shavings for the next batch of babies. 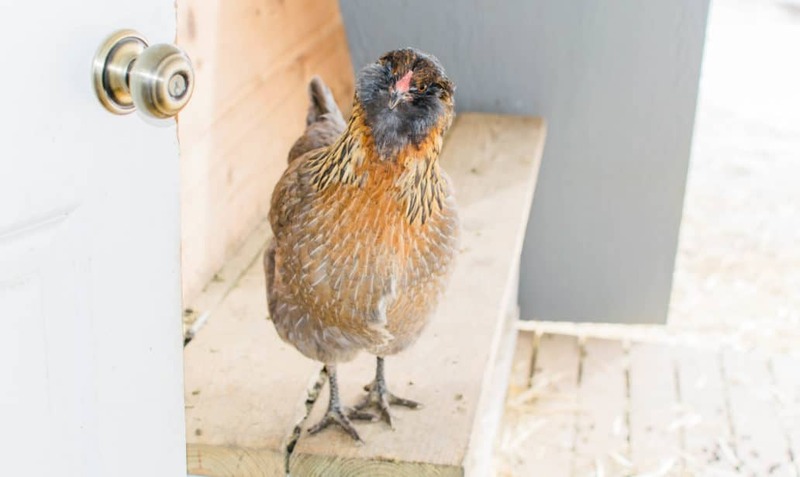 Confession – Last year, our naive and inexperienced selves planned to keep our baby chicks in the spare bedroom for the entire 6 weeks. Ha, that’s funny. Do you know how fast baby chicks grow? And how much they poop? And that they become weird gangly teenage chickens really fast? We added the plexiglass covering to reduce dust, but we ended up booting the baby chicks to the basement. BEST DECISION EVER. Need more details about raising chicks? Check out this post. 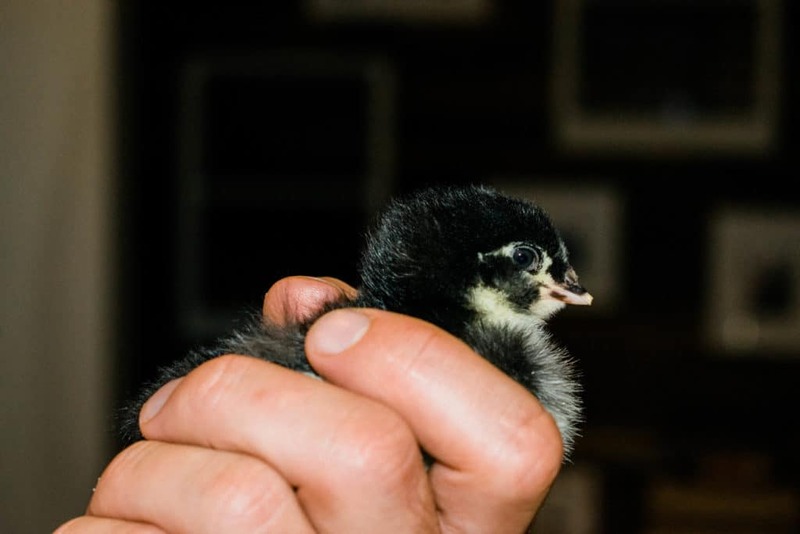 Are you getting baby chicks this Spring? Do you have any other DIY chick brooder box ideas? Let me know in the comments below!